The first plastic paddles ran from the Assault Hand Paddle mold are being examined and tested for a spring market debut. 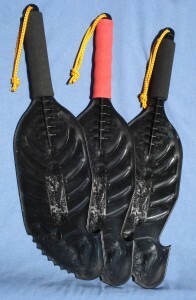 The paddles, however good they look in the photos, still need some refinement. The milling marks need to polished out, as well as blemishes. They expect a week or so for the polishing to be done. It was noted after the first test run that there was some other minor mold problems. It was determined the mold has to be reinforced with more platens. Flexing was occurring with the 250 ton pressure required to inject the plastic into the mold. This was causing the plastic to leak out and flash outside the mold. Platens are basically integrated supports that go inside the mold to provide more structural integrity. We are keeping our fingers crossed for our Assault Hand Paddle debut soon! This entry was posted in Backwater Paddle Products, Marketing My Company and tagged Assault Hand Paddle, Backwater Paddle Company, kayak fishing hand paddle on April 4, 2013 by Paddleman.